Luxembourg’s Gilles Muller and Cyprus’ Marcos Baghdatis took the court with the task of seeing who would be competing in the final against the most successful player in BB&T Atlanta Open history, John Isner. Baghdatis was trying to break his dry spell of not having reached a final since 2011 and Muller is in search of the first title of his career. During the first set, both players controlled the points on their serve. Muller had several lighting fast aces at the tee. Although Baghdatis and Muller were pretty evenly matched during the first set, Muller tied the tiebreak 2-2 by hitting a winning backhand as Baghdatis approached the net. Muller showed signs of fatigue, breathing heavy and wiping his forehead, then he committed his first double fault of the game. He still won the game on his serve, taking a 6-4 lead. Muller hit a hard forehand just inside the left side of the line to run off with the first set 7-6(4). Baghdatis started approaching the net more frequently, hitting baseline shot and even threw in a drop shot on occasion. Muller simply had no answer for Baghdatis crafty play and dropped the second set. The third set was physically tough and demanding for both men as they slugged it out. Unfortunately Muller ended the match the same way he started, a wild unforced error to the left side of the court. Baghdatis again concluded the match by kissing the court and celebrating his 6-7(4), 6-3, 7-6(4) victory. Ironically, he admitted after the match, "At 6-5, to be honest, I choked," when he was broken as he served for the match in the final set. 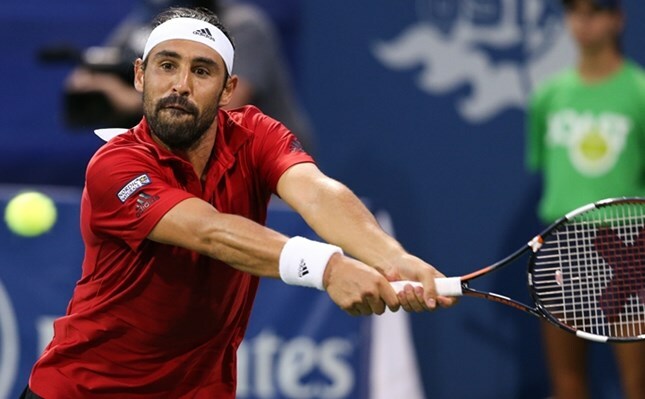 Baghdatis is into the final for first final since 2011. But, his task is daunting. He has lost to Isner in all five meetings, the last being a three-set defeat in Washington. "I think I have to find a way to mess up his (serve) and just find a way to win," the Cypriot said.